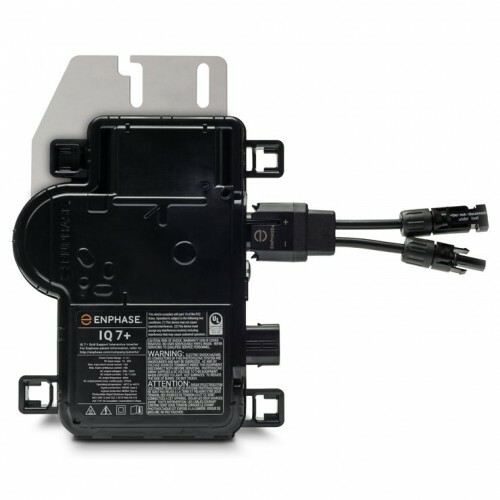 Enphase's seventh-generation microinverters are powered by a unique software-defined architecture, offering an efficient design with a single hardware SKU worldwide. The IQ 7 Micro series produces 4% more power, is 19% lighter and 17% smaller than the IQ 6 series. The IQ 7 Micro Series continues to offer the same ease of installation with revolutionary 2-wire cabling. It also leverages semiconductor integration for higher reliability and better economies of scale. The high-powered smart grid-ready Enphase IQ7PLUS-72-2-US IQ Microinverter™ dramatically simplifies the installation process while achieving the highest system efficiency. Because this microinverter is part of the Enphase IQ System, it will integrate seamlessly with the Enphase IQ Envoy™, Enphase Q Aggregator™, Enphase IQ Battery™, and the Enphase Enlighten™ monitoring and analysis software. IQ Series Microinverters extend the reliability standards set forth by previous generations and undergo over a million hours of power-on testing, enabling Enphase to provide an industry-leading warranty of up to 25 years. The Enphase Microinverter maximizes energy production by using a sophisticated Maximum Power Point Tracking (MPPT) algorithm. Each Enphase Microinverter individually connects to one PV module in your array. This configuration enables an individual MPPT to control each PV module, insuring that maximum power available from each PV module is exported to the utility grid regardless of the performance of the other PV modules in the array. While an individual PV module in the array may be affected by shading, soiling, orientation or PV module mismatch, each Enphase IQ7PLUS-72-2-US IQ Microinverter™ insures top performance for its associated PV module. NOTE: Enphase IQ Envoy, IQ Series Micros do not communicate with, and should not be used with, previous generation Enphase Microinverters, AC Batteries, and Envoys.